Alzheimer’s strikes again and the victims and their loved ones are propelled onto a tumultuous life Detour Down Desperation Road. Dr. Ann shares true stories of people who alter their lives and draw on extraordinary intuition and strength as they tackle problems, invent coping skills, and honor loved ones who slide deeper into dementia. Meet Ann’s strong, determined mother, known as ‘the hardware lady,’ as she hoards, obsesses, and persists while dementia slowly destroys her brain. Ann’s inner guides, emotional Ann and rational Ann, whisper contradictory advice as she struggles to help her mom. She finds solace with support group members and others who wrestle with daily trials and discover changed relationships and new realities. 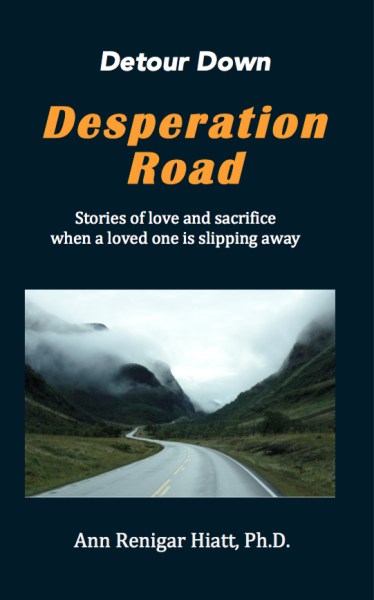 Their stories reveal feelings seldom shared by caregivers as they endure the realities of the Detour Down Desperation Road. You will learn, laugh, cry, and be amazed by their insights and ingenuity.